Portrait of American author/poet Edgar Allan Poe with original 1800s text lithograph. Long before Fight Club’s memorable utilization of an unnamed narrator – long before, as we’re talking 1845 – there was, printed with revisions in The New York World, a short story called Ligeia; written, ostensibly, by a man named Edgar Allan Poe. 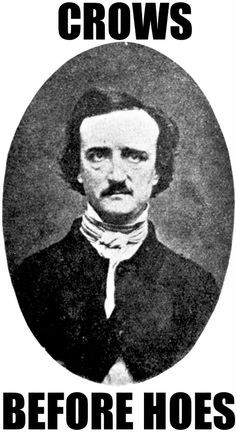 What makes the 1845 revision of Poe’s story more notable than earlier iterations (dating back to 1838) is the inclusion of a poem (in the story Ligeia is its author) – The Conqueror Worm. Though befitting the short story, Poe originally published it as a stand-alone work in 1843, two years prior. I first came across the poem in this form -standing alone, out of context – when I was very young (maybe eight or nine if pressured into venturing a guess). This was a time that, as I imagine for most of us, poetry held little meaning. I had neither the life experience nor the artistic appreciation necessary to understand poetry; it was as good as Greek to me, and until I read The Conqueror Worm I hadn’t yet come across anything that piqued my curiosity, let alone interest. This poem changed all of that in an instant. Though years would pass before I gained a deeper understanding of what Poe was getting at, I do recall being moved in a way I had not yet experienced through poetry (or any other medium); I had the sense that something already inside me – my head or my breast, maybe – had been dragged out and made manifest as concrete characters; that some universal narrative (these words being used in retrospect) had been perfectly captured by Poe – one that no one I knew had dared speak aloud for fear of its veracity. 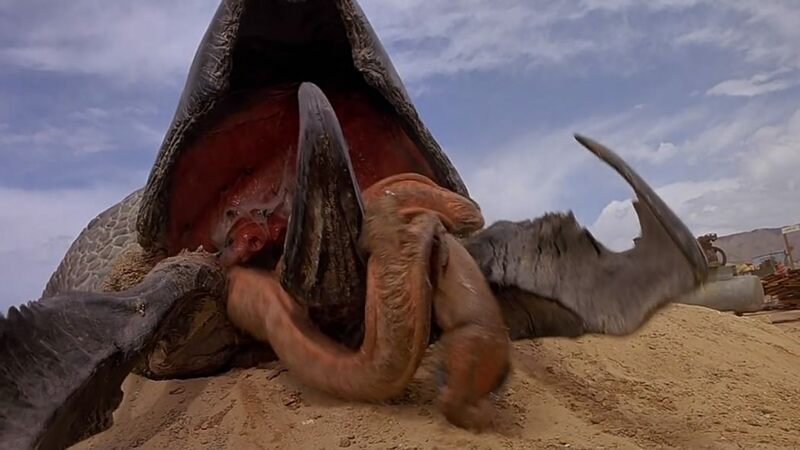 The Conqueror Worm is not a happy poem – if reduced or simplified, one might say it’s about the inevitability of death or perhaps a wider lack of control. As Poe is now considered to have probably been bipolar, I wonder at times if my eight or nine year old self might have experienced for the first time symptoms of that same “illness” I would come to be diagnosed with; or, perhaps, that on that day Poe put some of himself into me. Below I have first included the poem (I want to present it before talking about it in detail so you have the chance to form your own impressions); after I have included some of my own thoughts on particular lines and ideas. The first two stanzas are essentially describing a scene: a throng of angels is watching a play in some kind of theatre. I read this as more or less angels (or, or perhaps and, the souls of the departed) watching mankind from above – the “theatre” of Heaven, or just some higher dimension or plane of existence. The mimes are essentially slaves to some vast thing or things without any awareness of their enslavement. Poe interprets the implicit infinity in the plight of mankind very pessimistically; I don’t fully disagree with him, but as with any infinity I think this sort of entrapment or enslavement can also be viewed with a positive spin. 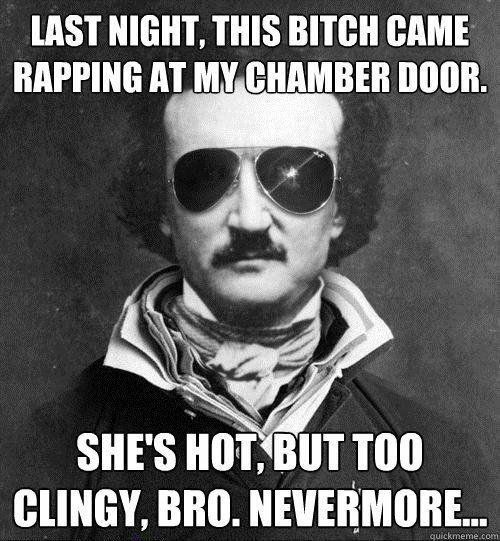 But Poe died young in a gutter, so I can believe and see why he was maybe a little down on humanity. In other words, when the curtain comes down at the end of our play, it’s pretty much our funeral. Remember, Poe was an artist, not a god – this is simply his interpretation of what he saw; his life wasn’t a happy one for the most part, so one can disagree with him while still appreciating the genius of his writing. I think what Poe truly captured here is an exceptionally accurate poetic image of depression – not some objectively true meaning of life. 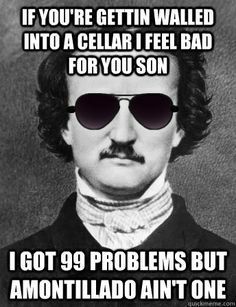 If you liked this poem or Poe in general, I recommend checking out two of his lesser known works – Marginalia and Eureka.